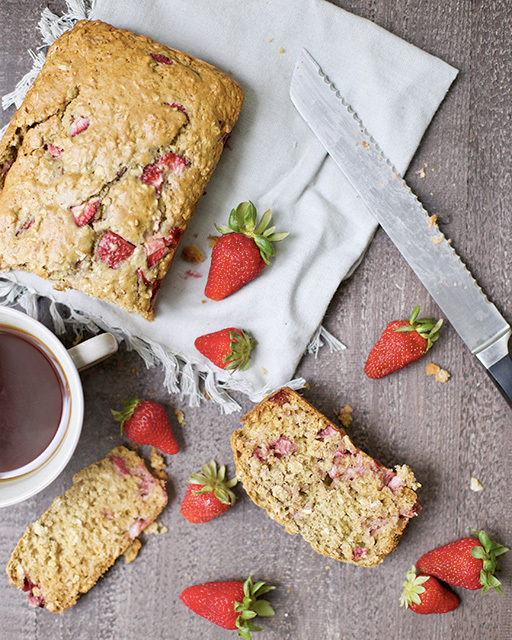 This deliciously moist bread is packed with fresh strawberries and so much flavor! A perfect breakfast or snack that the entire family will love. Hello strawberries! LOVE strawberry season! I seriously can’t get enough strawberries in any dish I make: savory, sweet, salads, or even as a snack. I’m excited to bring you all this yummy bread that gives you a creative option to use up some strawberries. I’m looking forward to strawberry picking this year with my kids, and plan on making plenty of these strawberry oat breads and keeping them stashed in the freezer. Can I just tell you guys how much I love a sweet bread for brunch, breakfast or a snack? Banana bread was always a favorite of mine growing up. Ever since I’ve learned how to bake, I’ve enjoyed coming up with so many different bread variations. 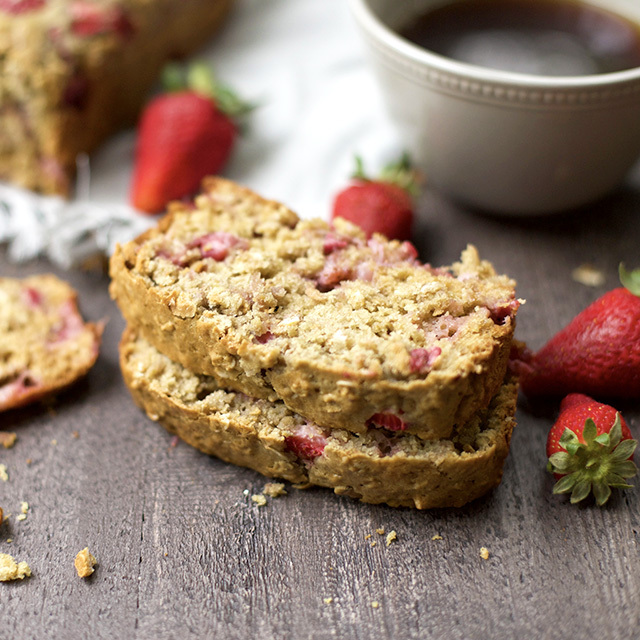 This strawberry oat bread is a new favorite breakfast item for my kids! I love the way this moist bread has the perfect amount of flavor that is not overly sweet, and tastes so good with a a little spread of butter. Breakfast breads have become something I make almost every weekend as I am doing my meal prep for the week. They are so perfect for an on-the-go breakfastI I can bake a loaf, and then freeze the leftovers so we can enjoy slices throughout the week. It makes a super easy breakfast item on those morning we’re running low on time, and it also is a great addition to the lunch box! I’ve added in some healthy ingredients to pack in extra nutrients: oats, coconut oil, and greek yogurt. It’s so easy to make without the use of a mixer, but just separating the wet and dry ingredients. Very little prep time for delicious results! Preheat your oven to 350 degrees. Grease a 9 inch bread loaf pan and set aside. In a large bowl, mix together your dry ingredients: flour, oats, baking powder, baking soda, and salt. In a separate bowl, mix together your wet ingredients: coconut oil, brown sugar, eggs, yogurt, and milk. Add wet ingredients to wet and continue to mix until all dry pockets are gone. Gently fold in strawberries. Pour into your loaf pan and bake for 50-55 minutes. Let cool for at least 10 minutes, then remove from pan.